Gravitational physics has grown over the past few decades from a small area of research concerned mainly with mathematical properties of Einstein’s theory of general relativity into a broad field whose theoretical aspects range from astrophysics and cosmology to quantum gravity, one of the most challenging boundaries of our current understanding of the nature of matter and space time. Gravitational physics has also developed a solid experimental side with the building of a variety of gravitational wave detectors and with high-precision tests of gravitational effects on Earth and in orbit; it has found practical applications in the GPS system as well as in the guidance of spacecraft. The University of Mississippi is at the forefront or modern research in experimental and theoretical gravity, astrophysics and cosmology. Here, researchers actively participate to the LIGO experiment. They study the emission of gravitational waves from astrophysical sources, try to understand the geometrical structure of space-time at the smallest scales, and contribute to the worldwide search for the ultimate theory of quantum gravity. For more details on the gravitational and high-energy theory research program at The University of Mississippi, see the GR website. The goal of the LIGO experiment is to detect gravitational waves, explore the fundamental physics of gravity, and develop the emerging field of gravitational-wave astronomy. The University of Mississippi is an institutional member of the LIGO Scientific Collaboration, contributing to the experiment in the areas of data analysis and detector characterization. One of the LIGO detectors is located in southern Louisiana, about four hours drive from The University of Mississippi. 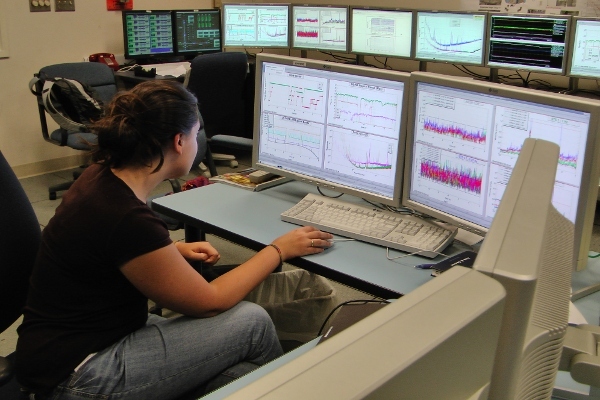 As part of their research, senior members of the LIGO Team and graduate students actively participate in commissioning and monitoring the instrument on site. At work in the control room of the Louisiana LIGO detector. The University of Mississippi hosts one of the most active groups working on binary systems composed of black holes and/or neutron stars. Our main goal is to use gravitational-wave observations of these binaries to test Einstein’s general relativity, to rule out alternative theories of gravity, and to tell black holes from more exotic alternatives. We are also exploring the astrophysical information carried by the full set of events that will be observed: LIGO will reveal important clues on the evolution of compact binaries and on their relation with gamma-ray bursts; LISA will tell us how the massive black holes lurking at the center of most galaxies were born, and how they grew during cosmic history. From a more theoretical standpoint, we are studying Einstein’s theory of gravity in the most extreme conditions with “numerical experiments” in which we smash black holes at speeds close to the speed of light. 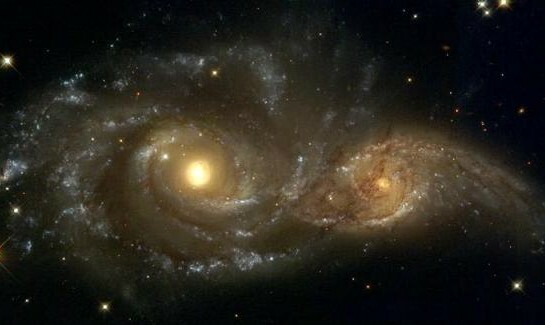 When galaxies collide, as in this image (credits: Hubble Space Telescope, 2004), the black holes at their center merge into a single black hole. Over the past decades, attempts to formulate a theory of quantum gravity focused largely on loop quantum gravity and superstrings. Loop quantum gravity aims towards a rigorous quantization of gravity as a theory of space-time geometry. Investigations at The University of Mississippi focus mainly on how the quantum geometry of space-time at the smallest scales leads to classical general relativity at macroscopic scales. Specific problems studied here include calculating the macroscopic observational effects of the microscopic quantum geometry, and finding quantum states for gravity, which appear like a classical continuum at large scales.